The United States’ top diplomat says that sanctions will remain in place until North Korea ends its nuclear weapons program. American Secretary of State Mike Pompeo spoke at a news conference in Seoul with the South Korean and Japanese foreign ministers. He said the administration of President Donald Trump would not repeat mistakes by earlier administrations. Pompeo dismissed a report from North Korea’s official KCNA about this week’s meeting between Trump and North Korean leader Kim Jong Un. It suggested Trump had offered to end sanctions before North Korea ended its nuclear program. But, Pompeo said that was not the case. Pompeo said that the U.S. wants verifiable action by North Korea to denuclearize by January 2021. He noted that the joint statement signed by Trump and North Korean leader Kim Jong Un confirmed an earlier declaration signed in April. 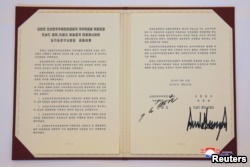 In the Panmunjom Declaration, South Korean President Moon Jai-in and Kim agreed to support past agreements which included verification requirements, Pompeo said. Many people has said that the Joint Declaration signed on June 12 lacked clear terms for how the North would end its nuclear weapons program. 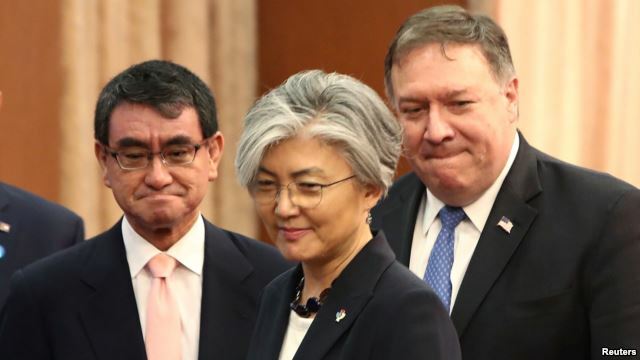 Pompeo met in Seoul Thursday with South Korean Foreign Minister Kang Kyung-hwa and Japanese Foreign Minister Taro Kono. 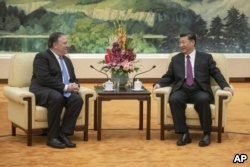 Later, Pompeo traveled to Beijing were he spoke to China’s foreign minister Wang Yi. After meeting with Kim, many were surprised when Trump spoke about joint military exercises, what he called “war games,” with South Korea. 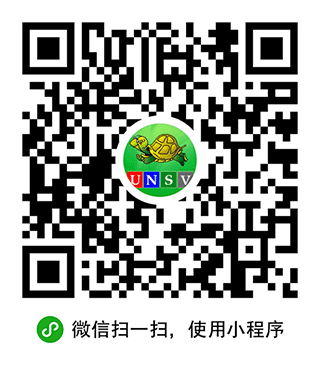 He said the large exercises would be suspended while negotiations with the North were taking place. Trump called the training, “provocative.” The president made the comments after his meeting with Kim. South Korean President Moon Jae-in has said he would carefully consider suspending the military exercises. 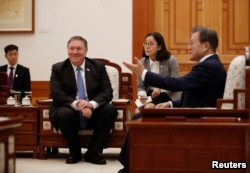 Moon met with Pompeo to discuss the summit in Singapore before the secretary of state met with his diplomatic counterparts. U.S. Secretary of State Mike Pompeo looks on as he attends a bilateral meeting with South Korea's President Moon Jae-in at the presidential Blue House in Seoul, South Korea, June 14, 2018. During the meeting with Pompeo in Seoul, Foreign Minister Kang said the alliance with the U.S. remained strong. She said details of military planning were not discussed. Foreign Minister Kono said Japan welcomed diplomatic progress with North Korea. However, he said Japan wanted the issue of North Korean missiles and other weapons that could strike Japan to be discussed. He also said Japan wanted U.S. troops to remain in South Korea. Japanese news media have reported that officials are seeking a meeting between Prime Minister Shinzo Abe and Kim Jong Un. The reports say Kim expressed a willingness to hold talks with Abe. Japanese officials plan to discuss a possible summit at a security conference in Ulaanbaatar, Mongolia this week. A summit could take place in August in the North Korean capital Pyongyang or during an area economic meeting in Vladivostok, Russia in September. Brian Padden, Ken Bredemeier and Michael Bowman reported this story for VOA News. Mario Ritter adapted it for VOA Learning English. Caty Weaver was the editor.